I have two major updates in my life that will perhaps significantly impact the output of this baking blog in the future. One of the most misunderstood things about gluten sensitivity – that even I had – was that one has to always eat lesser versions of gluten products. Gluten-free pizza. Gluten-free cakes. Gluten-free cookies. Like, eww? Every time a bakery or a restaurant championed itself as “gluten-free” my purist instincts scoffed at the idea of having a gluten-free version of the clearly superior original. But now that I am diagnosed as gluten-sensitive, my perspective is changing. In terms of savory foods, the perceived level of sacrifice I have to face seems alright. While I enjoy pasta and bread, these are Western staples that I rarely have at home. There are several savory naturally gluten-free options that I prefer, such as rice, rice noodles, and so on. I even compromise with my Austrian boyfriend by eating potatoes instead of bread. But what will I do now that I can’t enjoy classic American desserts? Red velvet cake, chocolate chip cookies, brownies… all these are things that are just full of gluten. The second thing that’s misunderstood about gluten sensitivity is perhaps the severity of the symptoms. Granted, this is on a case by case basis, but given that many gluten-sensitive individuals go years undiagnosed, you can infer that the symptoms aren’t all that bad. And really they aren’t. I have never been held captive in bed, or entered a life-threatening state due to this condition. But have I been too bloated to exercise, lethargic the entire day after a breakfast of pancakes, and excluded the possibility of wearing certain outfits due to my probable three-months-pregnant waistline by day’s end? Yes. Armed with this new-found understanding of my body, am I going to be posting more gluten-free recipes? Probably. But mostly because those recipes are MEANT to be gluten-free, such as macarons, certain brownies, puddings, some Asian desserts… I’ve grown up on Asian desserts such as red bean soup, cheng tng, and dried beancurd skin soup, so I have a wider repertoire of desserts than your usual baked butter/flour/sugar/egg combo. And thank goodness I can still consume dairy products with wild abandon. Cheesecake and ice cream in my belly! So why am I still baking gluten-ridden double chocolate chip cookies? Because I like chocolate cookies, plan and simple. But this gives me cause to exercise a little more self-restraint, to enjoy baking for its process as much as the finished product. Also, I just moved into a new apartment and I was burning for the opportunity to use the AWESOME NEW OVEN THAT FITS A FULL SIZED (13×18) BAKING SHEET! This is the second major update. I can’t tell you how much grief it gave me to have to use a 10×15 baking sheet. My baking times were essentially doubled due to how pathetically small that “urban living” oven was. Sure, it had a sleeker stainless steel finish but who cares about a nice looking kitchen when you can’t cook properly in it. 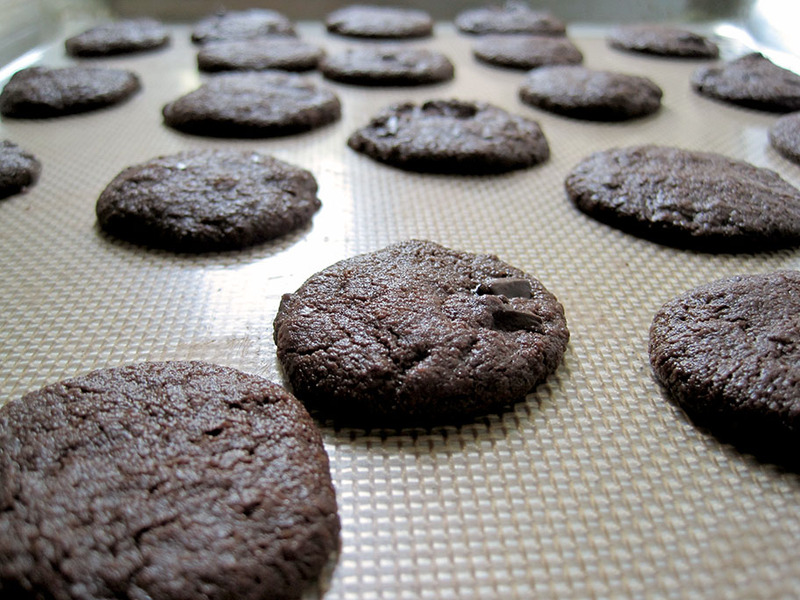 But now, I can bake twice as fast AND use my awesome non-stick silicone sheet! It saves me money I’d otherwise be spending on parchment paper and the clean up is so quick. I also get SUNLIGHT in the kitchen to take pretty pictures of my food. Before I’d have to actually move my food into the balcony of my bedroom in order to get some flattering natural light. These cookies are easy to make, bite-sized and its crumbly, sandy texture is rather European. The chocolate force is strong in this one, so definitely use real chocolate instead of crappy hydrogenated oil chocolate chips. Some packaged chocolate chips have a higher melting point due to the hydrogenated oils and thus stay intact when you bake them, but don’t you want ooey gooey meltedy chocolatey goodness in your cookies? I tweaked the recipe a little bit, and the most significant substitution is that instead of using light brown sugar, I used half regular sugar and half dark brown sugar. I’ve realized that you can calibrate the molasses level in brown sugar by simply adjusting the proportions of your dark brown and regular sugar content. Why buy three kinds of sugar when you can buy just two? Anyway, I hope you enjoy these cookies in a way that my gluten-sensitive bowels can’t. 1. In a small bowl, sift both flours, cocoa powder and baking soda together. 2. In a clean, dry bowl set over a pan of simmering water (or in a microwave), melt half of the chocolate (2½ oz, 70g), then let cool to room temperature. 4. By hand, stir in the melted chocolate, then the flour-cocoa mixture. Then finally the chocolate chunks. 5. Scoop the dough into rounded teaspoons and place evenly-spaced on the prepared baking sheet. 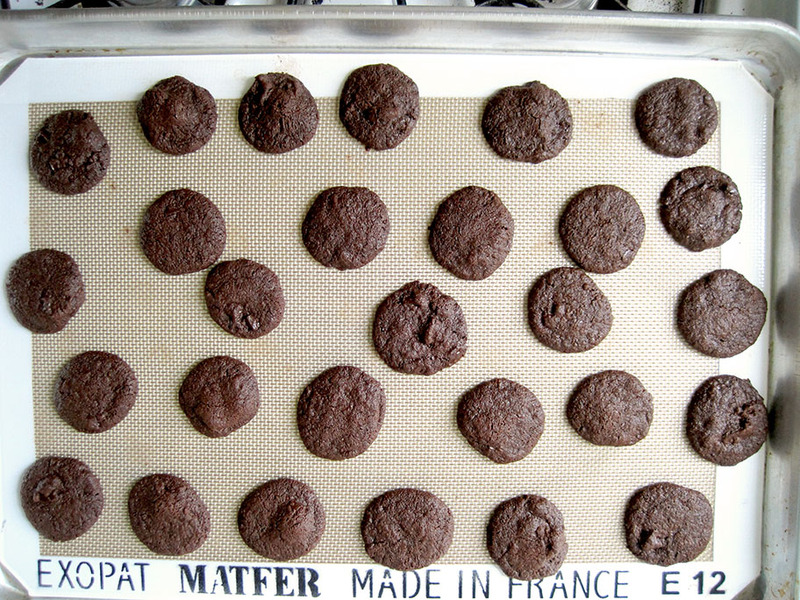 Sprinkle with cinnamon salt or fleur de sel, if desired, then bake for 10-12 minutes or until the cookies take on a slightly dry sheen to the top. They may feel soft, but don’t worry; they’re firm up just fine when cool.